The Bay Bridged - San Francisco, CA | CommitChange | We help organizations raise more money, more sustainably. 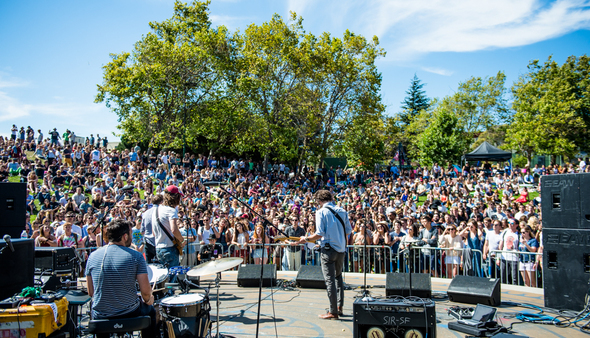 The mission of The Bay Bridged is to encourage public appreciation of San Francisco Bay Area independent music and to provide unique opportunities for local musicians to perform, receive exposure, collaborate, and create original works. For over eleven years, our nonprofit has showcased the best of the Bay Area music scene every day on TheBayBridged.com and at events like our acclaimed Phono del Sol Music and Food Festival. The Bay Bridged has spent the last decade showcasing all of the music that's being made in the San Francisco Bay Area, by everyone from critically-acclaimed, full-time musicians to history teachers who play gigs in the evenings. With your support, we will continue to provide critical exposure for local artists, especially emerging performers struggling to gain awareness early in their careers. Through your donations, we're better able to produce unique live events, intriguing feature stories, and expertly-curated podcasts, all created with the aim of highlighting local musicians. Your support helps us help them, and keeps our local music community close-knit and vibrant. Showcasing the best of the San Francisco Bay Area independent music scene has been our nonprofit's mission for the past eleven years, but we can only continue to do this with your support.